What’s with the blue double check in WhatsApp? Home News and Updates What’s with the blue double check in WhatsApp? The myth of the double check in WhatsApp has messed with the heads of many users of this IM service to the point of becoming the cause of a psychological syndrome and many, many breakups. Misinterpreting this little symbol has caused more than one romantic quarrel and now it seems the company is testing a new method to avoid such confusion: the double check will appear in blue when your message has actually been read. Problem solved? 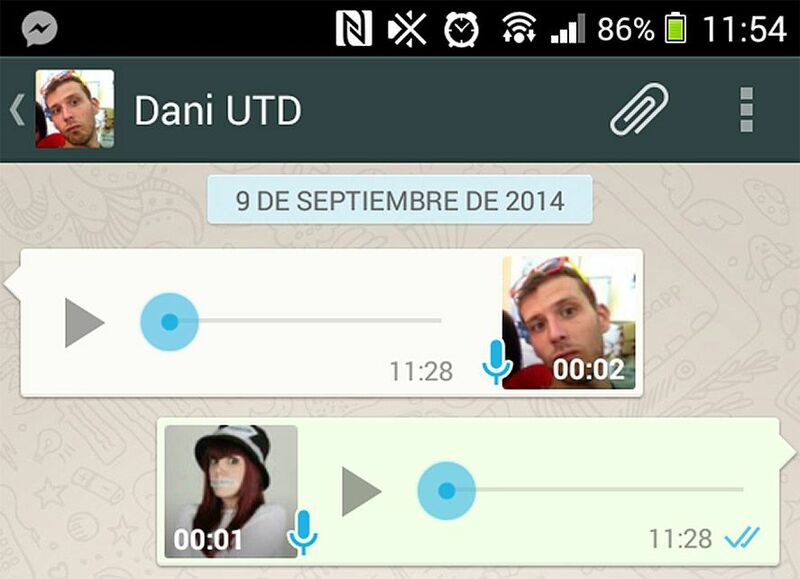 Updated (11/05/2014): The latest version of WhatsApp (2.11.43) now officially incorporates this feature, although it may not work on all smartphone models. In other words, a grey check means the message has been sent, two grey checks that it’s been delivered to the recipient, and two blue checks that it’s been read. You can also read here how to avoid these blue ticks. Until now, the tick marks accompanying your WhatsApp messages indicated one of two things: one tick to show that the message had been sent to the recipient and two to show it had been correctly delivered, which did not imply it had been read. The myth that the double check=message read eventually became so widespread that the company had to clarify how the ticks actually work on their official Twitter account. Some users have begun seeing a blue double check alongside the text just like—as of a while ago now—used to occur with voice notes. The change of color meant that the recording had been played and although WhatsApp spokespeople have not yet released statements to the effect, it seems they are now testing this feature in messages. Since there has not been an official statement, these are just suppositions but other users have also started seeing a double check in group chats where normally only one would appear, meaning everything indicates that WhatsApp is at minimum planning a few changes to appear in coming updates. In fact, the Italian website AndroidWorld has discovered a new file in the WhatsApp APK called “message got read receipt from target”. While this new feature may end the confusion surrounding the original double-check syndrome, it of course won’t eliminate the problem. How many people do you know who are constantly checking a person’s last connection time or online status? Now you’ll no longer have the excuse that you haven’t read that message. Previous articleWho’s searching for you on Google and what are they finding? the ticks turn blue on the delivered texts, what is the meaning of that? yeah, I noticed this since the start of November, unfortunately, it only happens with one of my contacts. I already knew about the check marks turning blue when the voice notes were listened, but it never happened when regular texts were read, I would love for it to happen for all my contacts, because I have wanted a read confirmation in whatsapp forever. Tick turns blue when the other person reads the message. One grey tick when sent. Two grey ticks when received. Two blue ticks when read. It’s mean that your message has been read by the other person. Dude. What about you read the article? it’s so clear you didn’t read anything… so read again, don’t be lazy!! are you thick or just blind mate? Did you read thru the article? means it has been read you idiot, did you even read the article? Seriously?? you read the whole blog and this is your doubt. I Just observed that a particular person on my contact changes blue when we chat, while others gray.. Why is it like that? I personally think that the reason for this is that the contacts that does not turn blue has not updated to the newest version yet. The article says they are testing this feature so that’s why you might see it work sometimes and sometime not. Also, it says you need version 2.11.43. Line, a similar application to whatsapp just displays the words “Read.” in small letters. Much clearer than an ambiguous icon. Anyone know if it’ll be possible to disable this feature? I hate “knowing” if someone has read a message or been online, so it’s great that I can hide my timestamp (and thusly not view other people’s timestamps)… So will there be an option to disable these blue ticks as well then? This works with some of my contacts but not all. Some contacts have read and replied but the ticks remain grey. Why is that? So it still won’t turn blue when the recipient read the message via smartphone’s status bar rather than actual app..
someone care to test it? I also have one problem that is i cant see one of my contact’s last seen and status…. on iphone some chats show blue ticks some others dont, why is that? they can see when i read it but i can see for some conversations. on Iphone i dont see blue ticks in some chats but they can see when i read it. why is that? why it only works on some chats? I think the recipient has to have the right version too. Most of my contacts show two blue ticks after they’ve read the message as explained above but some still only show two grey ticks even though I know they’ve read the message because they’ve already replied. I’m guessing they’re not up to date. Please sombody correct me if they know better. Why does it even matter. Who cares! I want my double blue tick back. I require a specialist in this hous to solve my problem. have to apply such methods to youir won blog. edifícios, empresas comerciais e industriais, parques e também jardins, áreas verdes e também logradouros públicos. visual data and are due to this fact qucker visible learners. coloration, in response to a College off Rochester examine.